Gigahertz-Optik's compact hand-held HCT-99D light and color meter provides fast, accurate incident color and illuminance (lux) light measurements of light sources in field service, production or research applications at an affordable price. Even though the HCT-99D was designed to measure traditional lamp sources it could be useful for some LED measurement work depending on the application. For best results when measuring lux and color quantities the BTS256-E Bi-Tec Sensor lightmeter is highly recommended. Please consult with the factory for further assistance. The ergonomically designed HCT-99D meter is simple to use. In the HCT-99D, a color difference function based on the calculation of delta uv is a standard feature. This is a color difference of the deviation of the measured x, y color coordinates from the black body radiator locus. The HCT-99D includes the CT-4501-4 light and color detector head that houses four filter corrected detectors response precisely adapted to the CIE spectral tristimulus functions. Silicon photodiode based detection ensures a stable, linear and wide dynamic light and color measurement range with long lifetime. An extra Xshort blue spectral response detector improves accuracy when measuring high color temperature sources. The HCT-99D light and color meter is calibrated and certified to international standards backed by Gigahertz-Optik's EN/IEC/ISO 17025 accredited optical radiation calibration laboratory (Registration No. DKD-K-10601 - pdf download). The HCT-99D colorimeter system includes the compact, hand-held meter, CT-4501-4 light and color detector, hard-shell carry case, USB interface cable, DLL and manual. Free Excel VBA program available on request. 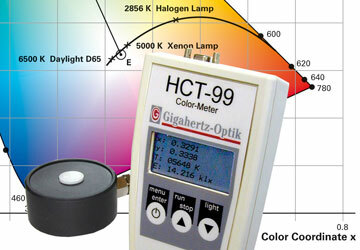 Technical, software and light measurement accessory components information for the HCT-99D Color Meter. You require qualified calibrated light and color measurements for million dollar production runs at multiple sites. You need precise, repeatable and reproducible results. Gigahertz-Optik's hand-held, fully portable HCT-99-D light and color meter. The HCT-99-D's compact ergonomic design makes it easy to use anywhere. Fully PC controlled measurements can be accomplished via USB interface, supplied DLL files and optional OS-X1 software. At Gigahertz-Optik, we have effective light measurement solutions for your radiometric / photometric applications.